Nobody beats Caco at his own game because even if you win you lose! 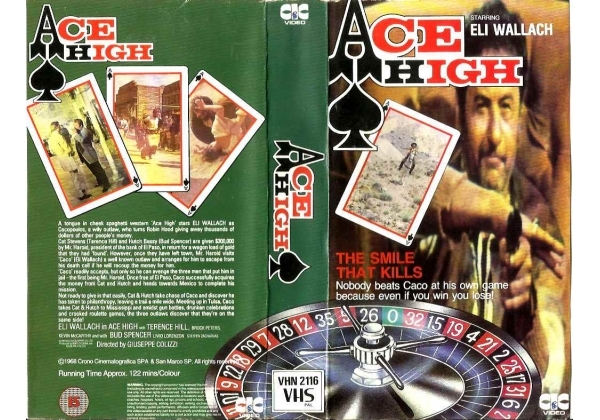 A tongue in cheek spaghetti western 'Ace High' stars ELI WALLACH as Cacopoulos, a wily outlaw, who turns Robin Hood giving away thousands of dollars of other people's money. Cat Stevens (Terence Hill) and Hutch Bessy (Bud Spencer) are given $300, 000 by Mr. Harold, president of the bank of El Paso, in the return for a wagon load of gold that they had 'found'. However, once they left town, Mr. Harold visits 'Caco' (Eli Wallach) a well known outlaw and arranges for him to escape from his death cell if he will recoup the money for him. 'Caco' readily accepts, but only so he can avenge the three men that put him in jail - the first being Mr. Harold. Once free of El Paso, Caco successfully acquires the money from Cat and Hutch and heads towards Mexico to complete his mission. Not ready to give in that easily, Cat & Hutch take chase of Caco and discover he has taken to philanthropy, leaving a trail a mile wide. Meeting up in Tulsa, Caco takes Cat & Hutch to Mississippi and admist gun battles, drunken celebrations and crooked roulette games, the three outlaws discover that they're on the same side! © Crono Cinematografica SPA and San Marco SP. Run Time Approx: 122 mins. Or find "Ace High" on VHS and DVD / BluRay at Amazon.